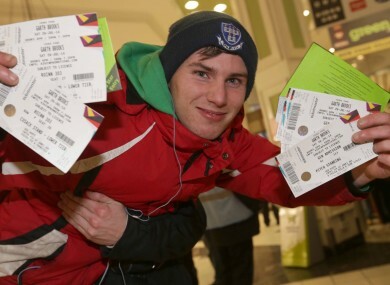 Darren Prendergast from Crumlin was pretty happy with his tickets. GARTH BROOKS FANS bought almost a quarter of a million tickets in just 90 minutes this morning, with three dates in Croke Park completely selling out. The total of 240,000 tickets means just under one admission was sold for every 25 people in Ireland, including the North. According to the promoters of the huge comeback event, it is the first time an artist has sold out three dates at Croke Park in one day. Garth Brooks’ manager Bob Doyle also released a short statement. “We’re thrilled,” he said. Promoters announced a third date on Sunday July 27 shortly after tickets went on sale for the Friday and Saturday shows at 9am today. Tickets are already being resold on eBay for as much as €300. Irish classifieds website DoneDeal.ie have said they will remove adverts on their site for tickets being sold at more than face value. Email “Garth Brooks sold one ticket for every 25 people in Ireland”. Feedback on “Garth Brooks sold one ticket for every 25 people in Ireland”.